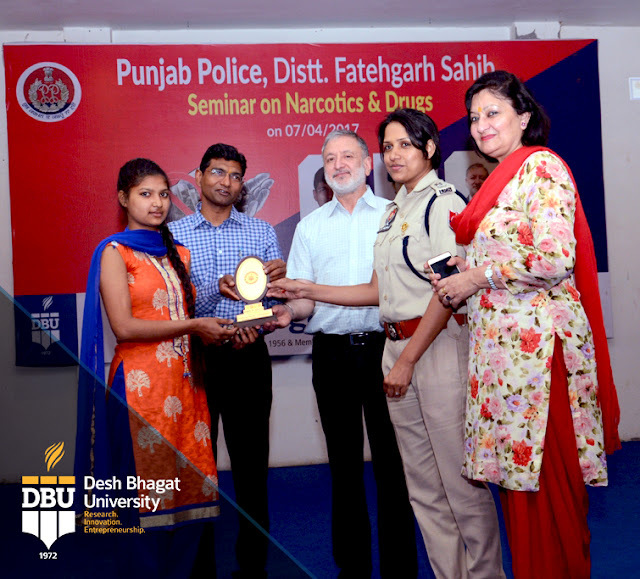 Desh Bhagat University’s Bhai Kanhaiya Ji NSS Department in association with Punjab Police, District Fatehgarh Sahib organised a seminar on the evil of Narcotics and Drugs. A large number of students from different faculties attended it. While giving details, Pro chancellor Dr. Tajinder Kaur said that the event was arranged to create awareness against Drug Abuse among youth. Dr. Kaustubh Sharma, IPS (DIG Punjab Police and Zonal Director, Narcotics Control Bureau Punjab, Chandigarh) was the Chief Guest on this occasion. Chancellor Dr. Zora Singh welcomed the chief guest and all other guests. 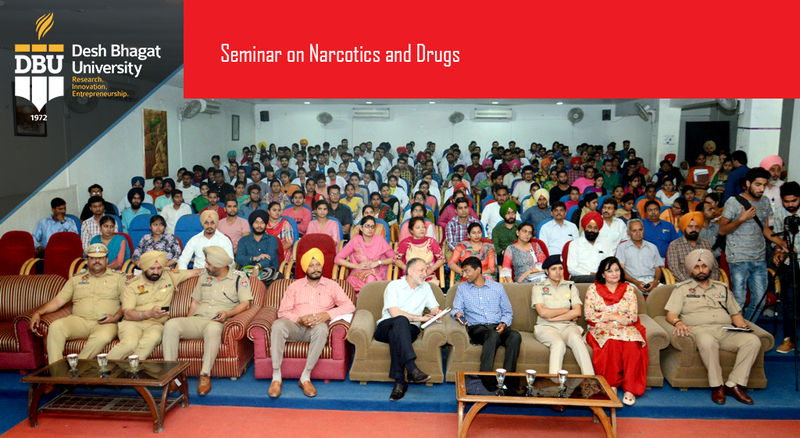 While interacting with the students, Dr. Kaustubh Sharma, IPS said that Drug addiction is a dark spot on the image of state of Punjab, we have to adopt a firm stand against all kinds of drugs, so that we may protect and save our holy state. 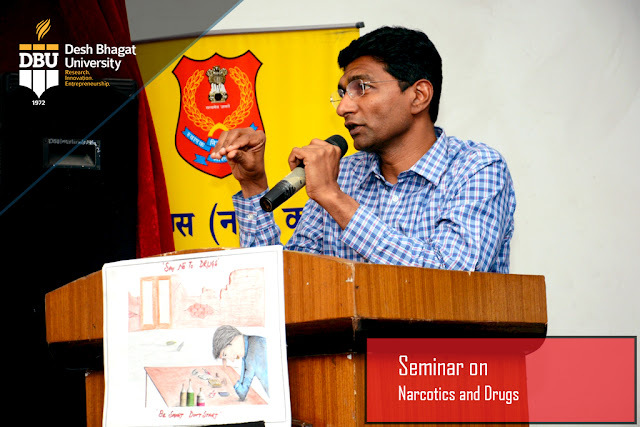 He exhorted the students to keep away from all kinds of drugs and come forward to vanish this menace from the society. Ms. Alka Meena (SSP, Fatehgarh Sahib) graced the event as guest of honour. She said that Drugs is the major reason behind most of the crimes and youth are more vulnerable in the society. We have to keep highly aware our students against drugs from the very beginning so that they can be protected from this curse. 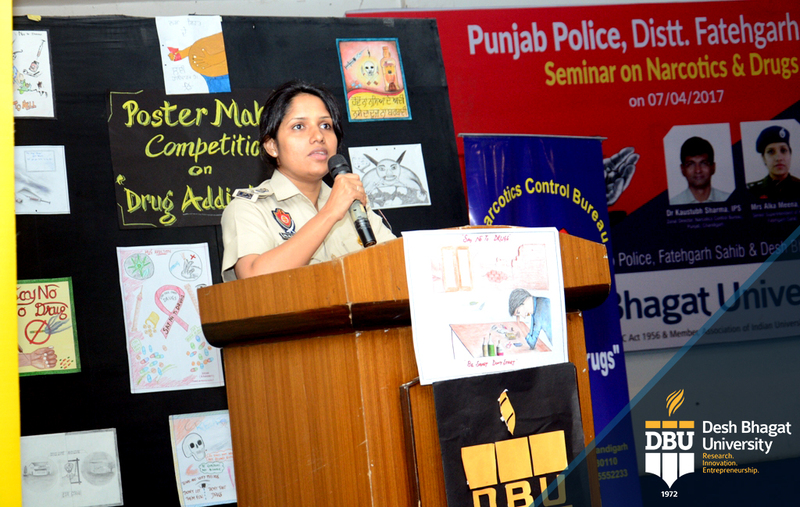 She urged the students and youth to come forward against drugs to make Punjab a healthy and rich state. Earlier, the welcome address was delivered by Sharanjit Singh (SP, Head Quarter). During the seminar a play on Drug abuse was staged by students of Pharmacy which encouraged everyone to stand firm against drugs. The students who got positions in poster making completion were honored by the chief guest. The winners are Gagandeep Kaur, Prabhjot, Pushpinder and RajShree Rai . A Physically challenged student Avtar Singh , who made a poster with his feet was especially honoured. The event was followed by a range of queries put forward by the students to which the learned speaker aptly replied. Vice chancellor Dr. Virinder Singh proposed vote of thanks and hope the event will prove fruitful for the society. Mr. Rajesh Chibber(DSP), B.S. Grewal(SHO, Amloh), Hemant Sharma ( Traffic Incharge), Dr. Kulbhushan, Dr. Surjit Patheja, Dr. Puja Gulati, Hod’s and faculty members were also present on the occasion.